Aqua Logic offers a wide range of standard and custom heat exchangers to meet just about any heat transfer requirement. These heat exchanger units are available with helix coils, tube sheets and plate. When you have a heat transfer challenge, Aqua Logic has the solution. Nothing can replace dependable performance. Fresh or saltwater safe, compact design and easy installation make Aqua Logic's Heat Exchangers the best choice for your hot or cold water loop system. 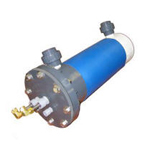 Aqua Logic's extensive heat exchanger offerings are used in many industries and aquaculture aquariums, including food, medical, industrial, aerospace, military, electronics and machine tools. With 75 years of combined thermal engineering experience, Aqua Logic has a heat exchanger to meet the requirements of every application.